Want a WIDE LOFT (2x2 grids)? We STRONGLY recommend you OFFSET the wide loft by shifting it OVER one grid length. OFFSET means that half of the wide loft is set directly ON the cage, the other half is shifted OFF. Why? 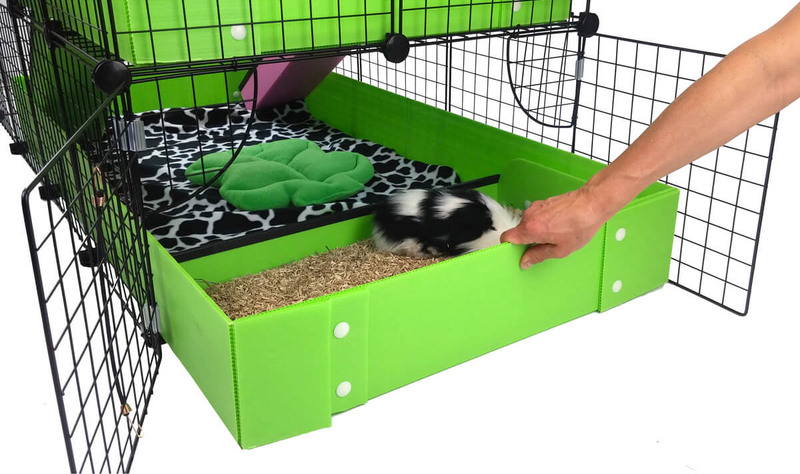 When a wide loft is installed directly above the cage, the average adult canNOT reach to the back corner of the cage. This is precisely why and where the guinea pigs will potty the most and run to when you want to pick them up. 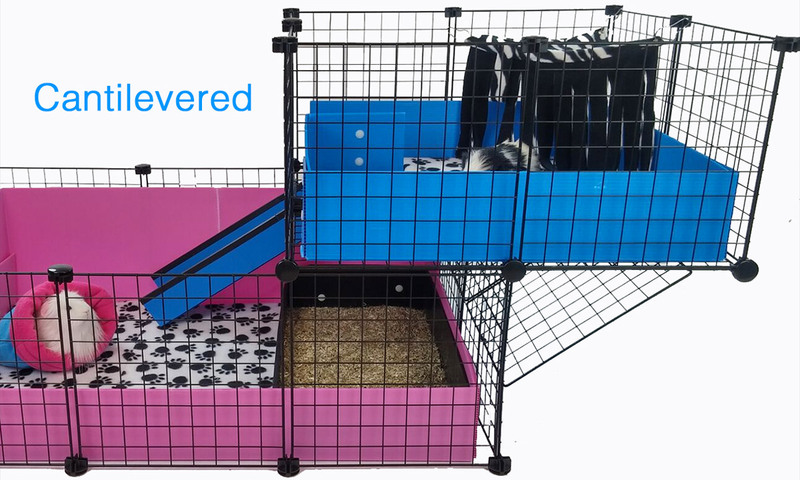 Offsetting the wide loft by one grid allows you to reach all the way across the cage under the loft to clean and/or retrieve guinea pigs, giving you the same easy access of the Narrow Loft, but keeping the benefit of the more spacious wide loft. Win-win! One ramp or two, doesn't matter, the same situation applies. Allow 15 INCHES PER LEVEL and/or GRID EXTENSION LENGTH. Grids are 14" SQUARE and you need to allow a little room for the connectors. You canNOT use an Offset kit and French Doors together (it’s one or the other). You don't need the French Doors when it's offset, and they simply won't work (design engineering-wise). You canNOT use an Offset kit with a Narrow Loft. The ramp would not be able to get through the end wall grids. Both are strong and stable. 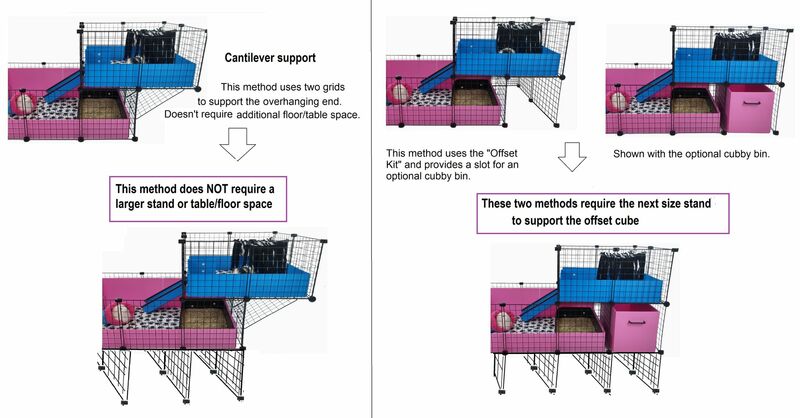 The "Cantilevered" option doesn't need the extra table space, floor space or longer cage stand below. 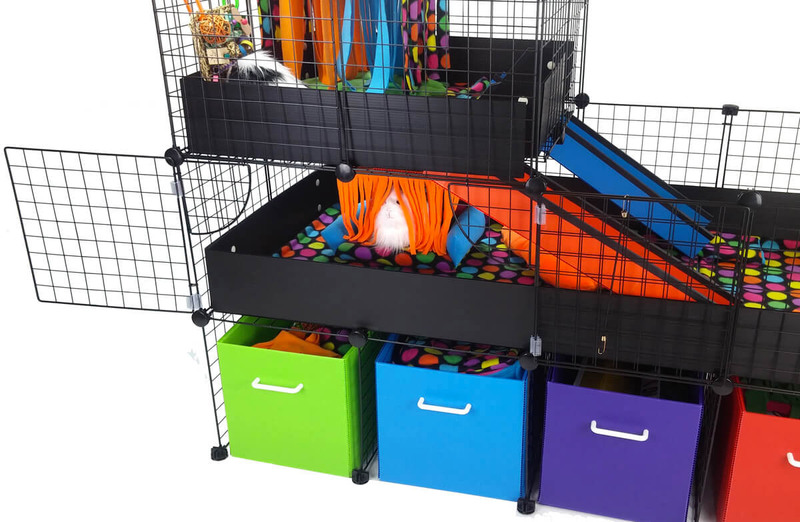 Whereas the "Standard" version allows you to use the extra storage space with or without an optional storage bin (noted below), but requires a longer stand. BOTH versions DO require a different cover -- if you need a cover. The offset changes the cover you need to the next larger size. 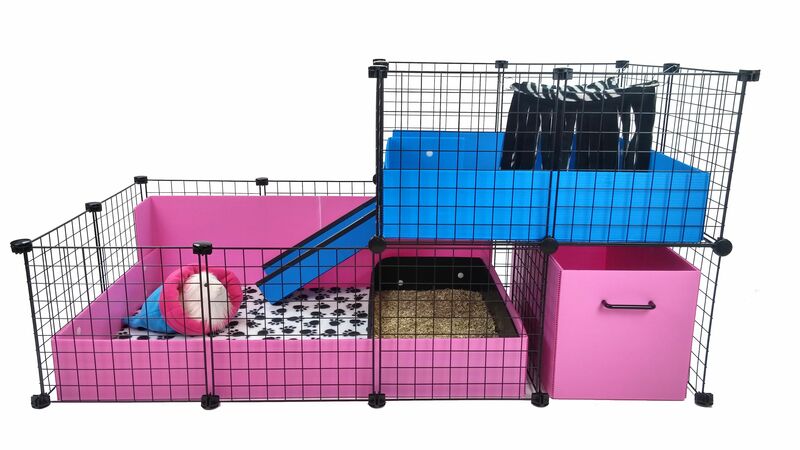 For example, a large 2x4 cage with a wide loft offset requires an XL/wide cover. You need to purchase it separately so you will have the correct parts. * Extras required: In a couple of cases, 3 extra grids are needed to cover the wide portion of the Wide Loft. The CANTILEVERED support option does NOT need a stand extension. 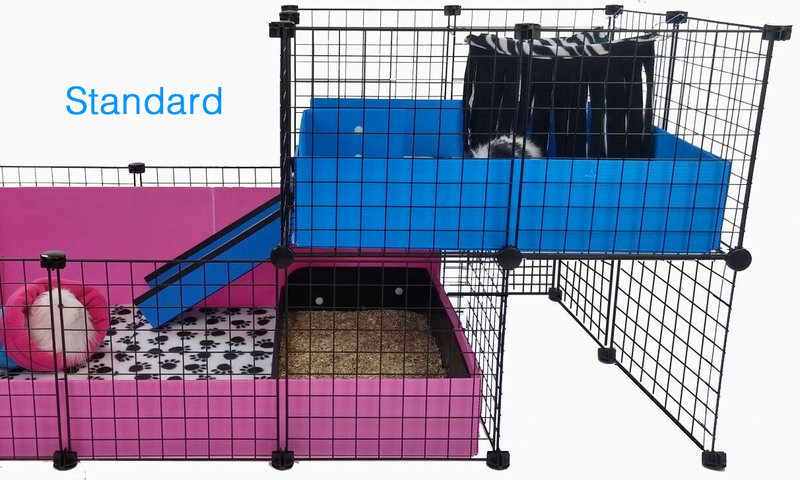 If you use the STANDARD support option, you'll need to expand your Cage Stand by ONE GRID in LENGTH. 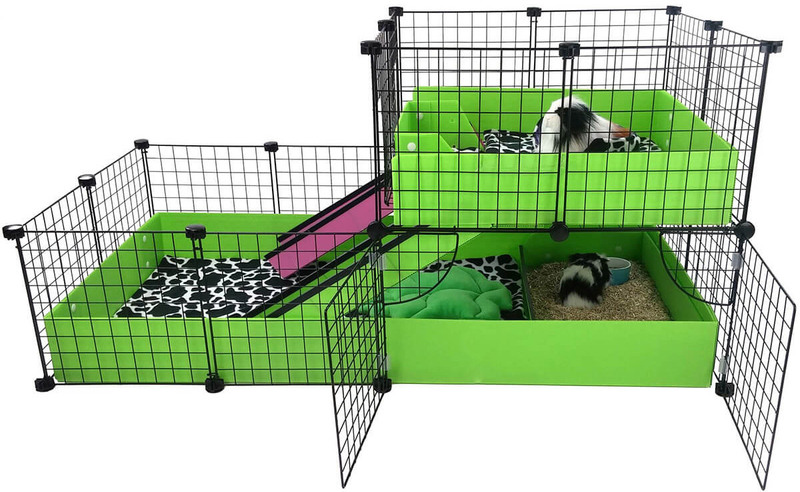 For the Jumbo Cage with Wide Loft using the Standard support option, since we don't have a 2x7 grid stand, you need the Jumbo Stand PLUS 5 grids and 5 connectors. There are two types of French doors: Front-Facing and END units. They are used to gain better access under a traditional (non-offset) wide loft. You CANNOT use French Doors with an OFFSET Loft in any circumstance. But, when you OFFSET the Wide Loft, you won't need French Doors! The French Doors were created in the first place to help compensate for the lack of access due to limited arm reach of a wide loft when it is straight up and down over a cage. But, even the French Doors won't help you retrieve your guinea pigs. So, the BETTER SOLUTION, is to offset the Wide Loft to start with. That obviates the need for the French Doors in the first place. FRONT facing French Doors require a full 2x2 grid WIDE LOFT structure above them to work -- NOT OFFSET. END unit French Doors require a Narrow or Wide Loft above to work, that is, a direct stacked wide loft (not offset). The only time you can use French Doors with a Narrow loft is if you have good access to the END of the cage. If so, you can use the END unit French Doors on a Wide loft OR Narrow loft. You cannot use them with a Narrow loft because it’s only a 1x2 grid structure. It is possible to use the French doors using the same rules as above. You can use the Front Facing French Doors with a directly stacked wide loft (not offset) with or without a stand. You can use the END unit French Doors with a directly stacked Wide OR Narrow loft with or without a stand.